(Reuters) - Los Angeles Mayor Eric Garcetti's White House hopes could hang on how he quickly he is able to resolve the city's first teachers' strike in three decades, which disrupted classes for nearly half a million students for a fourth day on Thursday. Although the 47-year-old Democrat does not have direct control over the nation's second-largest school system, he will mediate talks between union and district leaders after days of protests that grabbed nationwide headlines. Strategists said it also could tie his reputation to the outcome, with a quick deal giving him a boost while drawn-out scenes of the union's 30,000 teachers, about a third of whom are Latino, on picket lines could harm his standing with key Democratic constituencies. 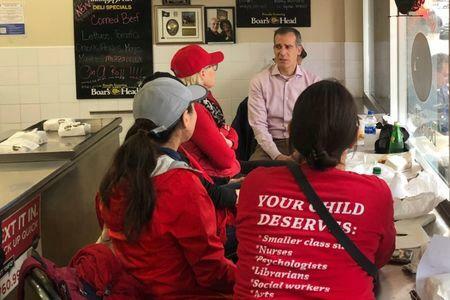 "Before the strike, I had this in the column of things that would be really hard on his presidential campaign," said Raphael Sonenshein, the executive director of the Pat Brown Institute for Public Affairs at California State University in Los Angeles. "If he's able to bring some influence to bear that contributes to a positive resolution, that would potentially be a plus." Garcetti is one of more than a dozen Democrats weighing whether to take on the Republican Party's presumptive 2020 nominee, President Donald Trump. White House aspirants are already scrambling to try to raise their national profiles and secure staff and donors. In his two terms as mayor and decade before that on the city council, the Spanish-speaking Garcetti focused on environmental and urban planning initiatives, seeking to cut back Los Angeles' famous dependence on cars. But other than leading the city's bid for the Olympic Games, which resulted in Los Angeles being chosen to host the 2028 Summer Olympics, Garcetti has rarely been in the national spotlight. 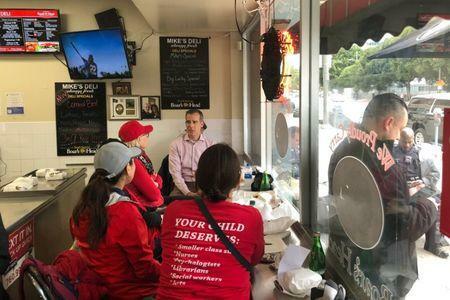 "This is an important and righteous fight about the soul of our schools," Garcetti told Reuters on Tuesday after chatting with several teachers at a downtown deli. "At the same time, we have to find the resources to do it. You can't spend money that you don't have." Garcetti recalled his grandmother's time working as an educator in the 1960s in Milwaukee. "It's kind of similar to now: We have a society that is increasingly polarized in terms of wealth," he said. "Those who depend on public institutions like public schools, if we can't make them work, we won't have a strong nation." A long strike could only hurt Garcetti's chances of building a positive national reputation, said Ben Tulchin, a Democratic pollster who has worked for Los Angeles school board candidates and former presidential candidate Bernie Sanders. "If it drags on, it's a huge inconvenience for Los Angeles voters," Tulchin said. "It makes a steep climb even steeper. He's got a lot of people he's got to leapfrog."